All of these are in the 97th percentile. 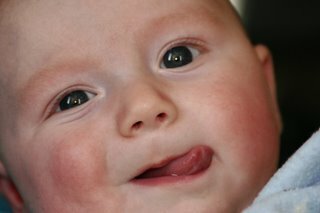 This past week he has really enjoyed sticking his tongue out. Tongue length must be genetic because both Gary and I are able to touch our tongues to our noses and I bet Kai will be able to as well. So this week I was slightly impulsive. 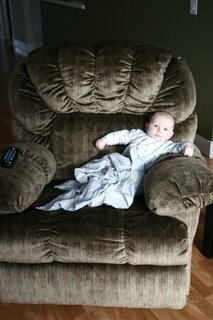 Usually I'm super Ms. Cheapo but I bought a brand new recliner! I saw the Brick had 50% off this recliner so I just bought it. It doesn't match super well but it is nice to curl up in and Kai loves to rock in it with me. We set up our Christmas tree this weekend. We decided to go with a fake tree from Costco. It is normally a huge tree but we took out the whole bottom section because when we had the whole tree up, we really didn't have much room in our house. Anyone who knows that I grew up on a Chrismtas tree farm may be shocked but we decided that its probably best to not kill a tree and in the end we'll prob. 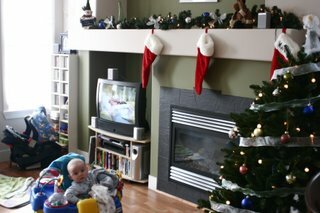 save some $:) Gary and I got to set up all the decorations that we bought last boxing day! Wow, this whole blog makes me seem cheap but I guess that's not the worst thing to be! Good job on buying stuff last boxing day ... dutchy. Kai is sure big. Enjoy the chair. Looking good guys, I love the new chair. And hey Gary, do you guys have a basketball practice antime from the 19th-Christmas? If not, I'm sure a pick-up game would be neat too. I noticed you were watching TLC Louise. Nice work. I can't believe the little guy is only four months. I feel like i've been hearing about him for longer than that. And if James comes to a practise, I'm really looking forward to the James/Cam match up, shoudl be brilliant. James will foul out so fast, probably give Gary the What-4. BTW, I think David VH used to have a recliner just like that. Dave? I thought he secretly gave him the finger?...maybe that was a secret!